We may not have created the Freak Shake concept BUT we’ve been SUPER successful with the concept, including landing a spot on The Poughkeepsie Journal’s Bucket List for Summer 2017! These are definitely designer milkshakes piled high with candy, confections…sometimes even cake slices, cookies, donuts and pies. There is NO way that you’ll say that you’re hungry after conquering one of these, and they BEG for photo ops with friends and family. They are made to order and are capable of being ordered “to go” either online or via phone order at 1-845-221-0488. But, be warned: some Joe’s Dairy Bar & Grill Freak Shakes are so gargantuan that there’s no lid or container big enough for that to happen. Take our word for it, you just have to try one. 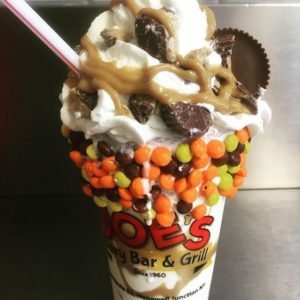 After all, The Poughkeepsie Journal placed it on their “Bucket List” and 101.5 WPDH has had us on twice to discuss the Freak Shakes (amongst other things). A few Freak Shakes are available whenever we’re open. BUT some others are seasonal and/or holiday-related, so for those, they’re available for a limited time or while supplies last. Peanut Butter Cup Freak Shake: this Instagram darling (over 23,000+ hits on our account) involves a milkshake of your choice, with peanut butter drizzled inside the shake itself with a cup rimmed in buttercream and Reese’s Pieces AND chunks of peanut butter crowning a thick cloud of whipped cream, with some more peanut butter drizzled across the top AND one huge peanut butter cup on the top! Unicorn Freak Shake: EVERYONE loves this freak shake…adults and kids alike! It’s a milkshake of your choice, with pink and blue marshmallow drizzled inside the shake cup, which is rimmed with colorful edible confetti, and topped with whipped cream, more marshmallow drizzle, a cupcake speared by a long, individually wrapped lollipop…and then, if that wasn’t enough, crowned with edible “luster dust” (or “fairy dust”). 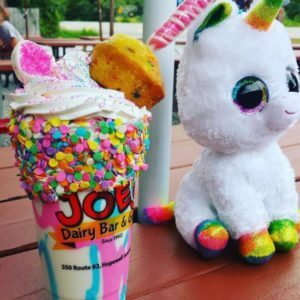 A very kind customer let us take a picture of the Unicorn Freak Shake next to her daughter’s stuffed animal and we appreciate it. They’re BOTH cute! We’ve ranked as high as in the Top 4 for #unicornshake on Instagram. That’s how popular our Unicorn Freak Shake is. It’s official. You need one!